Turkey, as many know it a country boasting with culture. It’s a country that offers an array of places to visit for a true cultural experience. From the traditional cuisine to its warm hospitality, there is much to experience during a holiday in Southern Turkey. The Carian coast is one of the many places to explore with a Turkish yacht charter. A blue voyage out to sea in the Mediterranean particularly aboard a classic gulet charter will give you that culture holiday you may be seeking. 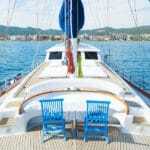 Should you decide on a yacht charter in Turkey, you might like to start from the charming town of Gocek. Gocek is a mere 20 minutes from the Dalaman International airport and one of the prime locations to embark from on a gulet cruise holiday. 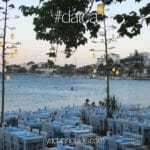 There are many itinerary choices when starting from Gocek town. One of the routes can take you along the Carian coast for a week, all the way up to the delightful city of Marmaris. 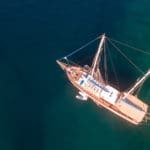 However should you wish to travel even further, you could continue your Carian gulet cruise past the Datca peninsula and either anchor in the Bodrum harbor or anyone of the lovely private bays nearby. Of course you do not necessarily have to rent a gulet to experience this amazing coastline. 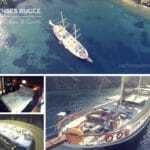 There are many other types of vessels such as motor yacht charters in Turkey. The only real difference is the vessel – while the yachting destinations remain the same. Just about all itineraries are suitable for these other Turkish boat charters. In addition to Gocek port, other places to start your Turkish yacht charter vacation is from Fethiye, Marmaris or Bodrum. All are within very reasonable distance from the airport. So you are not spending a great deal of time on the road to board your yacht rental. From the port of Gocek there are beautiful islands just minutes away. Additional places to drop anchor; might be around the town of Dalyan – via a ‘piyade’ (river boat) to see the ancient site of Caunos and the Lycian King Rock Tombs from the Dalyan river (tours do not go to the King Tombs as it is considered dangerous); past all the charming little bays and islands along the way; and over to Marmaris harbor for a stroll and shopping as well as sightseeing, such as the castle; further onward, there will be plenty of culture to see and experience on your Turkish yacht charter travels in the Mediterranean. Say for instance you are a family or a couple of families together, there are certainly a good variety of destinations for everyone in different ages to enjoy the southern Turkish coast. Yacht charter holidays for families in Turkey are very enjoyable with a great selection of water activities and land excursions combined at each port of call.